We offer NAVCO make Ball Vibrators. NAVCO Ball Vibrators provide high-frequency, directional and reliable vibration in multiple configurations. Ball vibrators supplied by KJN can be used to facilitate material flow in many types of storage containers. They are small, light weight and low maintenance. Ball Vibrators provide high-frequency, directional and reliable vibration in multiple configurations. 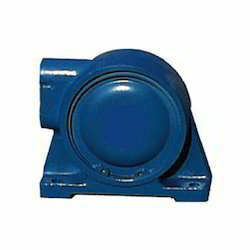 Ball vibrators are used for industrial and construction purpose. Ball vibrators use compressed air to push a steel ball around a raceway to produce rotary vibration. Ball vibrators can be mounted in any position and they can be fitted bolting on any patterns - so you can use it quickly and easily. Ball Vibrators are able to be used in high-temperature settings - up to 350 degrees! That's because we were able to eliminate the end-cover o-rings that melted down at 200 degrees. Ball Vibrators require lubrication for long, trouble-free operation. They can be mounted directly to the structure to be vibrated or they can be mounted with simple mounting plates for better vibration transfer. Looking for Ball Vibrators ?